When you train to get bigger, stronger, faster or leaner, your program must fit your body type. The program must address your specific weaknesses. Those weaknesses could be from a lack of strength, muscle or mobility. Indeed, a training program is only as good as its ability to cater to your physical structure, available equipment, and goals. When it comes to finding and fixing weaknesses, Eric Cressey is one of my top resources. 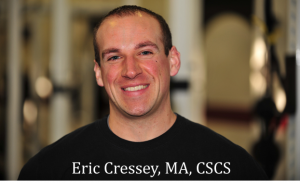 What’s unique about Cressey is his ability to create and implement assessment techniques that help you determine exactly how your program should be structured. I recently chatted with Eric Cressey about his approach to training, and how it’s evolved over the years. Check it out below. CW: Eric, you and I have been in this industry for well over a decade. We’ve both seen a lot of dysfunctions and imbalances whether we’re talking about a person’s physical structure or his exercise programming. With your experience, what would you say is a big mistake people make in pursuit of more muscle, strength and athleticism? Eric Cressey: I think a lot of people head down a bad path early in their training career because they lay fitness on type of dysfunction. In other words, they build a lot of strength through poor movement patterns. The longer people train in those terrible postures and incorrect patterns, the more ingrained they become. CW: I want to first make the connection between posture and performance. Posture goes beyond standing up straight. The position your ribcage and pelvis are in during training can make a huge difference in terms of how much muscle and strength you gain. It also determines how well you move. Let’s talk about posture. You’ve come up with a simple, self-assessment technique to help people determine which type of posture they have. 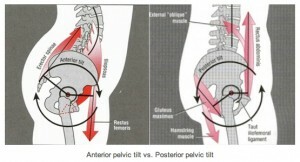 EC: Most people have a normal, subtle anterior pelvic tilt. For men it’s 3-5 degrees, and in women it’s 5-7 degrees. Problems typically occur when they deviate beyond those ranges, whether that means a more extreme anterior tilt, or for others, they could have a posterior pelvic tilt where the low back arch flattens and the hips tuck under. The majority of people will have an anterior pelvic tilt that causes as an extension posture. However, a cyclist or people who spend a lot of time hunched over at their desk can develop a posterior pelvic tilt that causes a flexed, hunched over posture. It’s important for people to identify what type of posture they have because it helps determine which exercises they should emphasize or avoid. CW: So the first step for determining how a person should train is based on their posture? EC: Yes, they could have a flexion, extension, or neutral posture. From there, the exercises I have them perform will help correct poor posture, assuming they have it. This is easy to identify with the self-assessment video I created. CW: With that evaluation out of the way, what’s the next programming factor you address? EC: Next up is their frequency of training. Within my program you have options for anywhere for 2-4 times per week for strength training based on a person’s recovery capacity and available time. If you’re a marathon runner who runs five days per week it’s probably not ideal to strength train four days per week. In that case, twice per week might be best. Or a younger, fit guy might choose to train four times per week to quickly gain strength and muscle. CW: And the third factor for determining how a person should train is based on their goals. A young guy who’s training for maximal strength shouldn’t train the same as an older person who seeks fat loss, right? EC: Correct. My programming allows people to choose between four different goals. They can choose whether they want to emphasize athletic performance, fat loss, maximal strength or maybe they have no specific goal at all and they just want to get in the best shape of their life. I even modify the training parameters for people over 40. CW: Flexibility work is often where people miss the boat, and I don’t blame them. Between the contradictions regarding how and when a person should stretch, it can become very confusing. I appreciated your video segment where you help people identify if they have joint laxity. EC: Not everyone needs static stretching. That’s why I help people determine if they should supplement their training with stretches. Some guys are naturally flexible. For them, foam rolling and a dynamic warm-up will be enough to meet their mobility needs. Other people will benefit from static stretches and my system shows them which ones they’ll need. CW: Ok, let’s recap. So if a person is trying to figure out exactly how he or she should train to meet their goals, they follow your four-part assessment that addresses posture, training frequency, goals, and joint laxity. I think that covers the gamut. CW: I frequently check your blog and I’m really impressed by your relentless pursuit for creating top-notch instructional videos. I don’t know where you find the time to shoot all those videos! EC: Ha! I drink a lot of coffee. All kidding aside, my new training system, The High Performance Handbook, has over 200 exercise videos. Each video has 30-120 seconds worth of verbal cues so people will learn exactly what to do, and why. CW: Thanks for your time, Eric, it’s always great to talk shop with you. Eric Cressey’s new training and nutrition system is one of the best I’ve seen. He put a prodigious amount of work into creating a system that caters to your unique structure and function in order to catapult your muscle, strength and athleticism. 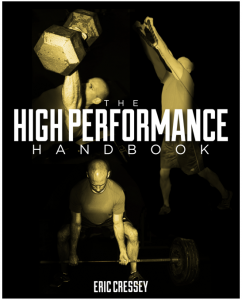 I give The High Performance Handbook my highest rating. I can’t think of a better investment into your training future. The entire training and nutrition system is on sale until Friday. You can check out more information at this link. This entry was posted in Gain Strength, How To Build Lean Muscle, Mobility Exercises by Dr. Chad Waterbury. Bookmark the permalink.